Among the premiere players from Armenia, Vladimir Akopian was an accomplished prodigy shortly after he first started playing chess. He won three of the biggest junior tournaments, all within a few years, and became a Grandmaster around the time he was 20 years old. Eventually he challenged for the World Champion title, but came up short. He continues to be an extremely strong player. Vladimir Akopian was born in Armenia and learned to play chess early in his life. At a young age he won the trifecta of World Junior tournaments: in 1986 he won the World Under-16 Championship, in 1988 the World Under-18 Championship and in 1991 the World Junior Chess Championship. 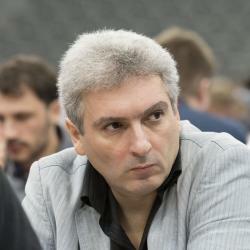 He was awarded the International Master title in 1988 and the Grandmaster title in 1991. As he got older, he won the Armenian Chess Championship multiple times and in 1999 he played against Alexander Khalifman in a match for the World Championship. Khalifman prevailed in this match with a score of 2 wins, 1 loss and 3 draws. He has continued to be one of the best players to come out of Armenia, and still plays incredibly high-level chess despite no longer challenging for the World Championship.